Every day is a good day to sparkle! This sparkle tunic set from Slinky Brand adds a little panache to your everyday look. 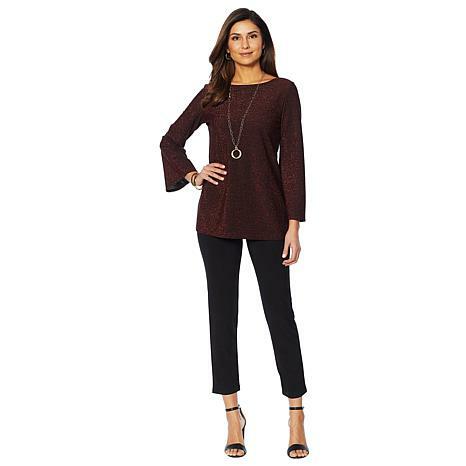 Top Fit: Semi-Fitted: Designed for 3 to 4 inches of ease between body and garment. Measures 3" - 4" larger than the fit-critical body measurement. Somewhat close to the body, but cut for ease of movement and fabric drape. It looked nice, but it did itch a little. The pants were too thin for winter pants and they were far too short for me. I am 5'7". Fabric in the top is too irritating to the skin. Returned.